A little known problem with regard to anesthesia continues to plague patients and the medical community worldwide. According to the Medical Protection Society (MPS), the largest global organization aimed at protecting the interests of medical professionals, nearly one third of all insurance claims related to anesthesia involve dental damage during procedures requiring general anesthesia. When operating on patients--especially those in high risk categories--several types of equipment and techniques can inadvertently damage teeth. For example, the upper incisors may see damage if a laryngoscope is used incorrectly. Teeth, crowns, and bridgework--all factors that put patients at high risk for damage, can become dislodged or damaged if the oropharyngeal airways are cleared with some force. Use of jaw clamps can put inordinate pressure on the teeth, especially when used with an oropharyngeal airway; so, too, can hard bite blocks, when used with a laryngeal mask airway or during oral fiber optic endoscopies. In addition, oropharyngeal suction devices can cause patients to clamp their jaws, while dental props and mouth gags can damage teeth at insertion, removal,or as they move laterally from one side of the mouth to the other. Through better communication with patients, anesthesiologists may be able to eliminate many, if not a majority, of incidents of dental damage as patients undergo general anesthesia. Interviewing each patient scheduled for surgery and touching on topics related to their oral health can help anesthesiologists change the course of anesthesia method, technique, and equipment used, as well as postpone certain operations while patients address issues like periodontal disease or airway obstruction. The MPS concludes that educated patients can make better, actual decisions with regard to going through procedures and evaluating their options with their chosen doctors. For years, clinicians worldwide have used DIY methods for creating bite blocks aimed at preventing teeth breakage during surgeries. DIY bite blocks, accomplished by hand rolling of multiple pieces of gauze, have multiple associated challenges--lack of consistency in softness, compression, and absorbency, as well as being less sterile for infection prevention and control. The advent of products like Richmond’s Soft BiteBlock™ should be game-changing as more clinics and operating rooms adopt their use worldwide. Produced on the same platform as industry-leading braided cotton rolls and other award-winning dental products, the Soft BiteBlock™ is available in small, medium, and large sizes, so that anesthesia teams can better protect both adults and children. These potentially revolutionary products reduce the potential of compression on the endotracheal tube or laryngeal mask airway, a risk that can cause a decrease in oxygenation. Furthermore, they protect the teeth and tongue, shifting pressure to the back molars rather than the front teeth. Richmond's newly packaged SKUs meet joint compliance for individually wrapped products used in anesthesia. To combat the frequency of incidents of dental damage, clinicians must change their consultations to include addressing the risks of dental damage during anesthesia with their patients. 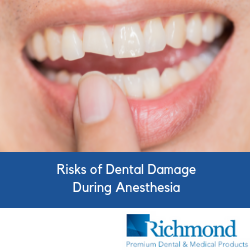 Furthermore, they should discuss different options for anesthesia, as well as postponing procedures to treat dental and medical conditions that place patients at high risk for dental damage. Products like our Soft BiteBlock™, made by US manufacturers with the highest standards for quality and consistency, can also provide a game-changing approach to protecting the teeth during surgical procedures requiring general anesthesia.